The roots and the river bank called to me. We spoke of shadow and light. I like this tree in both color and black and white. I adore the root structure. Thanks Cee. I have to say the color version does absolutely nothing for me. As soon as I saw this section of stream bank I knew it was going to be a black and white photo. An eloquent conversation. My preference is for the mono. You and me both Gary. This photo, and a few others taken along this stretch of stream on the same day were all destined to be monochrome. The lack of green and the tannin stained water really did nothing for me. Beautiful work. Love the reflection. This is a good response for the “dialogue” theme. Both photos “talk” to me. Lovely! Again someone who likes the color version as well as the B&W. I may have to rethink my position on just how unexciting I think it is. Stunning reflection in the waters in the photo(s). Well done on the photos. I can’t decide which one I like better, both have amazing clarity and are so sharp to the eye. Hmmm, I think I’d go with the first one as I love colour. Great job on this week’s challenge. Thank you Mabel. I must admit I’m quite surprised at the number of people that like the color version. To me the color version just so blah and the black and white much more dramatic. It certainly goes to show just how differently people can experience the same photo. You’re right. We all have different perception of things. For me, I like seeing life in the photos that I take. So I will gravitate to anything that is bright, vivid and most certainly of colour. 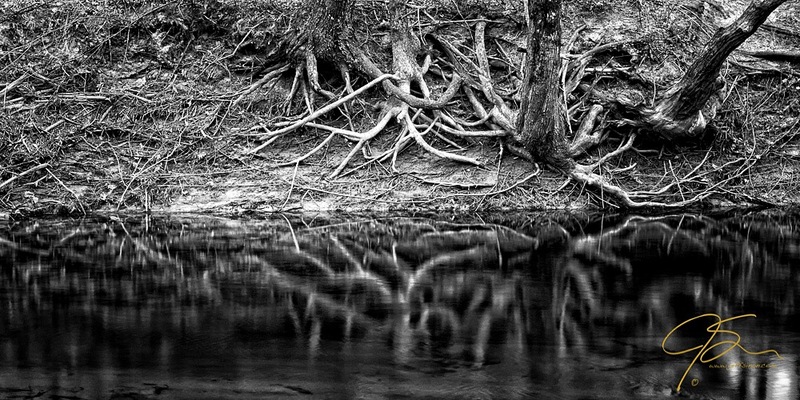 I too tend to gravitate towards color, but these roots absolutely called for black and white. I’m often torn between color and B&W and these images provide that same conflict. Both beautiful, both with intriguing elements. Nicely done! Thanks LB. Some times it is a tough choice, and the decision can change daily depending on my mood. I agree that the b/w is a winner! Great capture. Thanks Patti! I’m glad people like the color version, but the B&W is for me still the winner. Un Gran Trabajo, Me Encanta El Reflejo En EL Agua. En Este Caso Me Gusta Un Poco Más La Fotografía En Color… Un Saludo y Buenos Disparos….